A new deal every day from Audible. Today’s deal ends 04/23/2018 @ 11:59PM PT. 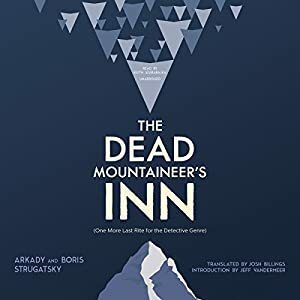 From the Russian masters of sci-fi comes The Dead Mountaineer’s Inn, a hilarious spoof on the classic country-house murder mystery. When Inspector Peter Glebsky arrives at a remote ski chalet on vacation, the last thing he intends to do is get involved in any police work. He’s there to ski, drink brandy, and loaf around in blissful solitude. But he hadn’t counted on the other vacationers, an eccentric bunch, including a famous hypnotist, a physicist with a penchant for gymnastic feats, a sulky teenager of indeterminate gender, and the mysterious Mr. and Mrs. Moses. And as the chalet fills up, strange things start happening – things that seem to indicate the presence of another, unseen guest. Is there a ghost on the premises? A prankster? Something more sinister?